How do you currently manage the revenue of your optometry practice? If you're not already collecting historical patient claims and billing data, you might be missing out on potential revenue. With more sophisticated revenue management systems in place, you can analyze deeper data on your claim filing, billing performance, and audit risk. 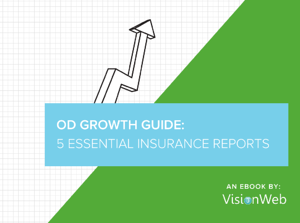 Our latest ebook, An OD Growth Guide: 5 Essential Insurance Reports, explores the importance of big data in generating 5 specific reports that highlight where your practice is missing out on revenue. If you're new to deep data analysis and trend reporting, our ebook will walk you through what to look for and how to change your business processes. With each report, we outline what is being analyzed, its value to your practice, red flags to look out for, and how to avoid any errors. New eBook "An OD Growth Guide: 5 Essential Insurance Reports"
Download a free copy of the eBook for our deep data insights today.